Rather unique in appearance among the owls, South Dakota represents the northern part of the Barn Owl's range. 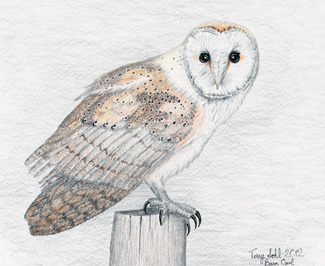 Barn Owls are among the most widespread of all land-based birds, and can be found on every continent except Antarctica. Roosting by day and active by night, the Barn Owl's raspy shrieking call can occasionally be heard as it flies overhead. Significant populations have recently been found roosting and raising young in cavities dug into the sides of bluffs lining the Missouri River near Pierre. Recent winter sightings also suggest that some Barn Owls may indeed attempt to overwinter in the state. Habitat: Generally found in open to semi-open country. Can be found nesting in rural buildings such as barns, abandoned farm houses, and other agricultural and rural buildings. Diet: Primarily feeds on rodents and other small mammals. May occasionally feed on birds, large insects, lizards, and rarely fish and frogs. Behavior: Hunts almost exclusively at night, only very rarely during the day. Usually hunts by flowing low and slow over the ground, finding prey by both vision and with its acute hearing. Studies in controlled environments in complete darkness have shown Barn Owls can capture prey in the complete absence of light. Migration: South Dakota represents the northern edge of the Barn Owl's range. 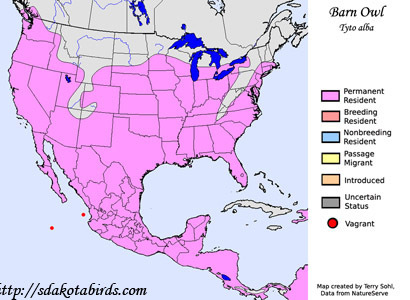 Birds in the northern portion of their U.S. range generally migrate southward in the fall. Some recent sightings during winter months indicate that some may attempt to overwinter in the state, however. Similar Species: Generally a distinctive look compared to other owls. Conservation Status: Numbers appear to be decreasing in parts of its range in the United States. South Dakota Status: Rare summer resident in southern portions of South Dakota. Casual in winter.